Scout patrol 20th Btn. 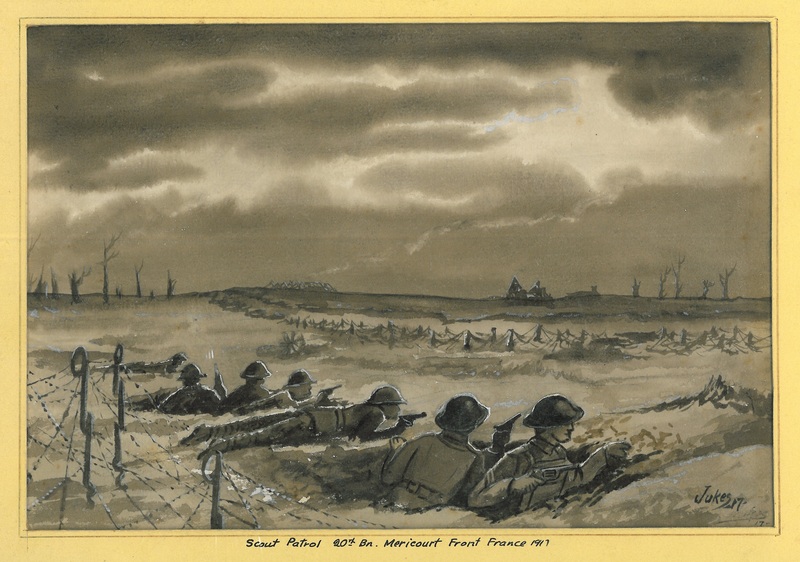 Mericourt Front France 1917, watercolour. Reuben Alvin Jukes, c1917. One of the consequences of the majority of the Canadian population immigrating to the country in the 19th and early 20th century was that at the outbreak of the war many families found themselves divided in their loyalties to their new, British controlled country. Those who had travelled from Germany, the Austro-Hungarian Empire and parts of what is now Ukraine suddenly had relatives in the Triple Alliance army, and even their own loyalty began to be doubted. Many were sent to internment camps and even those who escaped imprisonment were often ostracised and driven out of their communities. Yet, these communities also contributed many volunteers to the CEF; one of these families was the Jucksch (later Jukes) family of Hanover, Ontario. Our collection holds the uniform and two watercolours belonging to Reuben Jukes, who served as a scout and observer with the 20th Battalion after volunteering in 1914. We recently found out the Reuben’s brother Arnold Homer also volunteered in 1916 at the age of 25 after serving two years in the militia. The brothers were the son of Ernst August Jucksch and his wife Mary Kalbfleich; August Jucksch (as he was later known) immigrated from Sternberg, Germany as an 8 year old. He later settled in Hanover and ran a successful cabinetry business, according to his grandson Don he was known throughout the county for his artistry. By the time the war began the boys had grownup and had careers, Reuben as an artist and Vaudeville performer and Arnold Homer as a decorator and bass baritone singer. Like the thousands of other young men across Canada, the Jucksch boys volunteered to serve their country. Reuben painted his experience in the trenches on small pieces of paper that were smuggled back to Canada disguised as a dead soldier’s effects; he was gassed in 1918 and later treated for shell shock and would survive the war to return to Ontario. Reuben founded a sign painting company that is still owned by his family today. His war watercolours have been exhibited at the Tom Thomson Gallery and have sold at Bonhams auctions in the UK. Arnold Homer, later just Homer, enlisted as a lieutenant with the 147th Battalion, later joining the 58th Battalion as their intelligence office, largely because of his fluent German. He proved an avid trench raider, receiving the Military Cross for raids at Avion Trench near Lens and a bar for a nearly perfectly executed raid in January 1918. 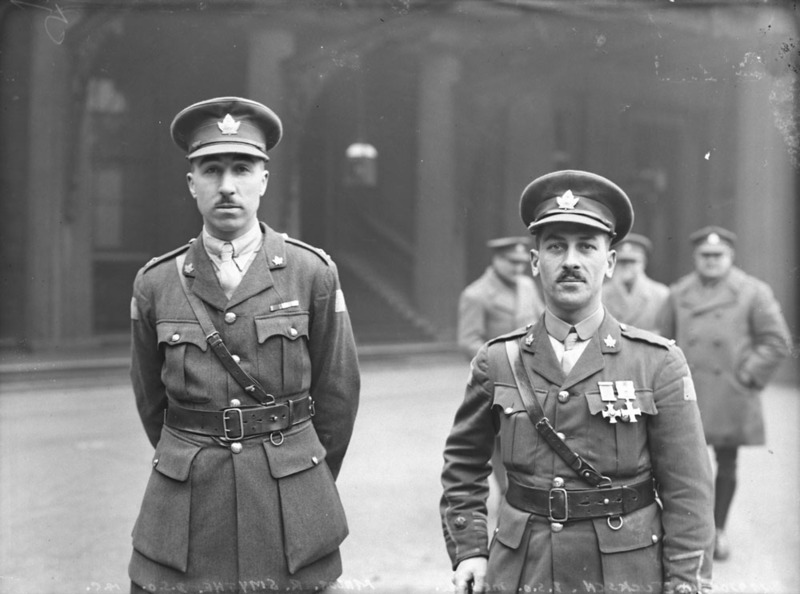 He was later promoted to Major and received the DSO from the King in 1919. Homer later immigrated to California, dying there in 1958. Both men later anglicized the spelling of their name to Jukes, which the family continues to use today. The Jukes sons are just one example of families with a German background whose Canadian born sons served fighting against their relatives; indeed the experience was certainly not limited to Canadians. Robert Graves, whose relatives the Von Rankes still lived in Germany, recalls letters sent to his mother detailing that he and one of his cousins were within miles of each other on opposite sides of the trenches. Despite the fiercely nationalistic tone of wartime propaganda and governments, for many families the war also meant that they may have had to face their own countrymen or even relatives at some point on the front. Another interesting story. The CCGW seems to have a wealth of artifacts from the Grey-Bruce area of Ontario. I noticed the photo of main-street Chesley, a town just north of Hanover, on another page. Thank you for your comment! We will be emailing you shortly.